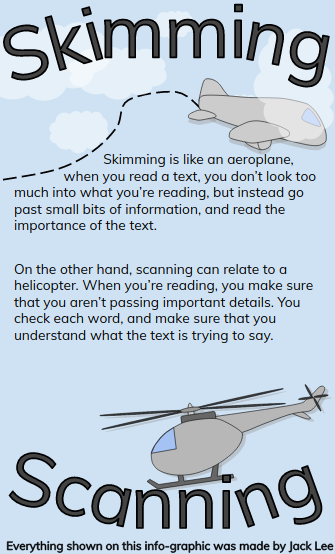 This week as an extension to our reading, we had to make an info-graphic (Information With Pictures) showing the differences between skimming and scanning. An example we were given was that skimming is like an aeroplane, knowing they pass things quite fast, and can't stay in one place when flying. The example we were given for scanning was a helicopter, because they can hover over one area without moving.